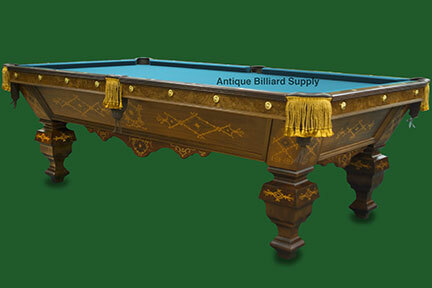 #3-12 Ornate Brunswick antique pool table of highly figured walnut burl. Extensive inlay patterns comprised of multiple exotic woods. A masterpiece of 1800s craftsmanship. Rosewood rail tops with diamond sights. Eight-foot size, four-piece Vermont slate playing surface. Completely restored, ready for immediate delivery.